ABS-CBN anchor Ted Failon and three other Kapamilya staffers on Tuesday, August 15, posted bail following an arrest warrant for libel issued by a local court in Tagaytay City. 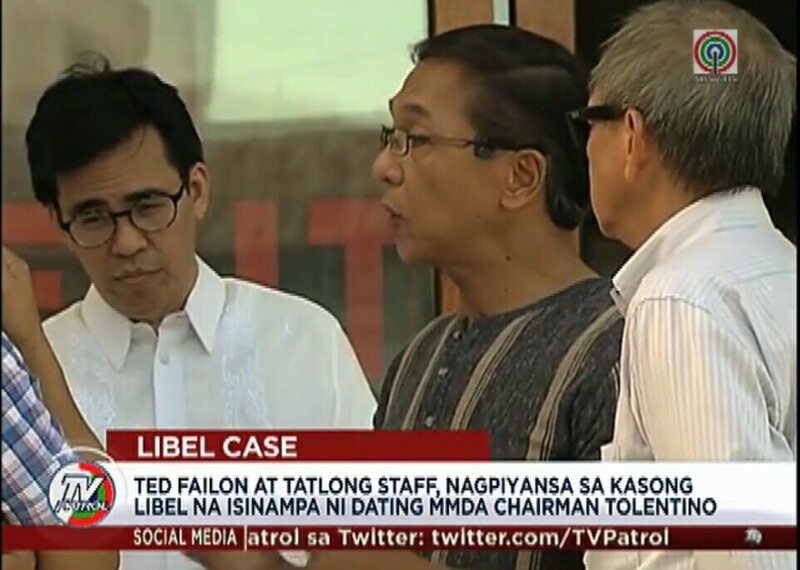 The defamation case filed against them by former Metropolitan Manila Development Authority (MMDA) Chairman Francis Tolentino stemmed from a report aired on Failon's weekend public affairs program, Failon Ngayon. The televised report, which aired in December 2016, looked into MMDA's alleged questionable purchase of secondhand motorcycles used during Pope Francis' apostolic visit in 2015. According to Tolentino, who now serves as a political adviser to President Rodrigo Duterte, Failon's reporting has besmirched his reputation. "Naniniwala kami na ginawa po 'yung episode ng Failon Ngayon [ay] base po sa katotohanan at wala pong halong malisya," said Failon's lawyer Carla Pingul. "Ito po ay maipapakita namin sa trial at mabibigyan po kami ng hustisya."